Preheat the oven to 200ºC, gas mark 6. Slice 1 essential Waitrose Aubergine lengthways into 4 and place on a greased baking tray. Spread with 1 tbsp pesto and season. Slice 1 Waitrose Jack Hawkins Slicing Tomato into 8 and lay on top of the aubergine; spread with 1 tbsp pesto and season. Cut 2 small essential Waitrose Courgettes in half and slice each into 4 lengthways. Place on top of the tomatoes. Spread with 1 tbsp pesto and season. 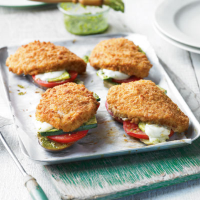 Slice 125g essential Waitrose Italian Mozzarella into 8 and place 2 pieces on each stack. Top with a chicken breast from a pack of 4 frozen essential Waitrose British Chicken Breast Steaks. Bake for 30 minutes until golden.